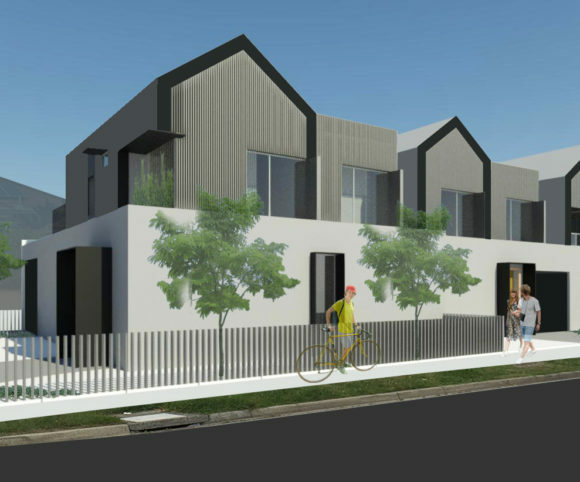 The project is located in Springvale in a general residential zone of the City of Greater Dandenong. At early concept stage, the brief requires three townhouses with two bedrooms, two bathrooms and single garage. The design responds to surrounding context taking into account vernacular forms and scale. The ground level of each townhouse connects to private open spaces in the back while upper level provides one meter setback to reduce the visual bulk and articulate the overall facades to fit in the neighbour houses’ scale. The material palette includes cement rendered brick, timber cladding, steel window hood and colorbond roof and wall cladding. The bifold wood screen provides privacy and flexibility acting as a sun protection layer for north and west elevations.